Supported software CorelDraw, Photoshop, Illustrator, AutoCAD etc. The new PLUS series designed maximum effective working style. With the high speed Step motors, Inner guide , Japanese bearings and maximum speed design it will up to 1 meters/second engraving speed, 600mm/second cutting speed . The BEST CHOICE in market. Depends on your material you have to use different working tables. The new PLUS series has Honeycomb table , Knife table as standard configuration . It has vacuuming under honeycomb table. With the pass-through design easy Access to use big size material. *If you want up/down table.we can also provide. The new PLUS Series was designed by manufacturer from CHINA. It was build on 10 years experience , customer feedbacks. Machine Body's Thickness is from 1.5mm to 5mm. Total machine is 1.5 times than other machines in market. Machine with high stability. LED Lights from left and right side looking machine inside view very bright. 1. 0ur Laser machine adopts 64 DSP digital controlling technology. 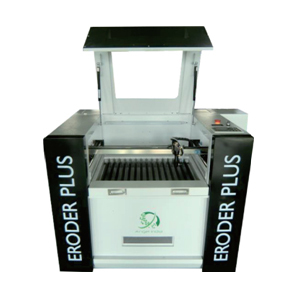 It offers function of successive, rapid and curved cutting, optimization of shortest processing path to create high efficiency and stability. 2. The newest software is matched to AutoCAD, CorelDraw and other graphics processing software for outputting original graphics. It defines engraving sequence freely to realize one time or whole output. 3. Professional accessories are provided for various processing. Honeycomb table is suitable for textile industry, aluminum blade table is usually used in advertising industrial, rotary is supposed to engrave or cut cylinder such as pencil vase.